Hot Jupiters: check. Super-Earths and mini-Neptunes: check. Up next is another unusual class of planet. But what is different is not these planets’ physical properties but the shapes of their orbits. Time to get technical. An orbit is the path a planet follows around its star. The simplest orbit is a circle with the star in the middle. All orbits are ellipses, basically stretched out circles. An orbit’s eccentricity (usually “e”) measures how stretched out it is. The higher the eccentricity, the more stretched out the orbit. Also, the higher the eccentricity, the more offset the position of the star compared with the center of the ellipse. This image shows how an orbit’s shape changes with its eccentricity. 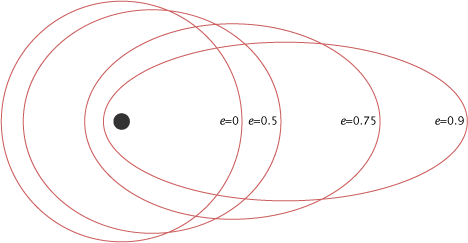 Orbits with the same average distance from the star (“semimajor axis”) but different eccentricities e. The higher the eccentricity, the more stretched out the orbit. Credit: NASA Earth Observatory. Earth’s current eccentricity is less than 1%. Jupiter’s is about 5%. The highest eccentricity among the Solar System’s planets is Mercury’s, which is about 20%. The Solar System, as usual, is well-behaved. The class pet. Let’s take a look at the eccentricities of extra-solar planets. We only have well-measured eccentricities for planets that are pretty massive. Mostly gas giant planets like Jupiter. Below is a plot of the eccentricities of planets versus their orbital distance. The shapes of well-measured orbits of extra-solar planets. Each dot is a single planet. Earth and Jupiter are shown for scale; each have near-circular orbits. Credit: Exoplanets Data Exoplorer. As you can see, there are a lot of planets with stretched-out, eccentric orbits. Among planets with orbital distances in the Earth-to-Jupiter range, the average eccentricity is about 0.25 (25%). There are some planets with small eccentricities similar to the ones in our Solar System. There are even some on wide orbits that are near-circular. But there are far more planets with non-circular, eccentric orbits. Some of these orbits are ridiculously stretched out! Today we are meeting our galactic neighbor HD 80606 b. It is labeled in the above figure as one of the crazies. Let’s take a closer look at its orbit. 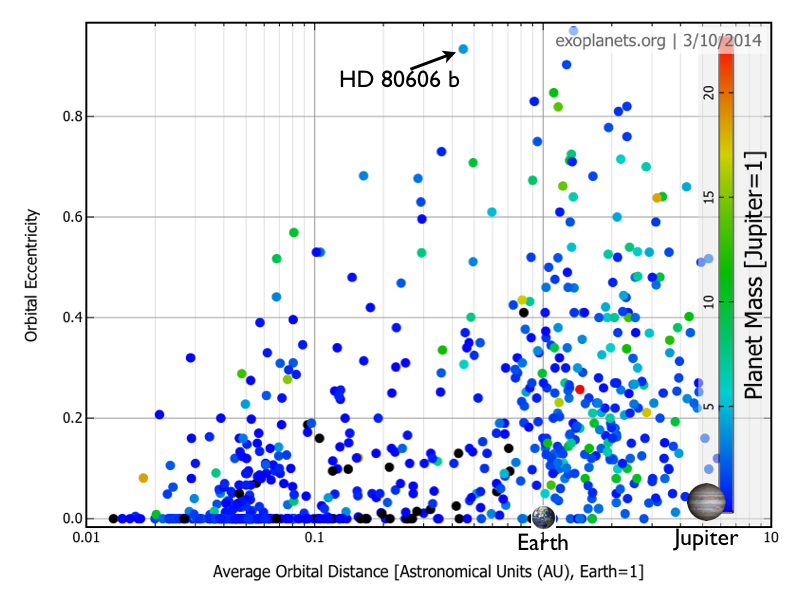 Orbit of the planet HD 80606 b compared with the orbits in the inner Solar System. Dots along the orbit are equally spaced in time, showing that the planet moves much more quickly close to its star and more slowly farther away. Credit: oklo.org. At its most distant point, HD 80606 b is about as far from its star as the Earth. But at its closest point it is just 3% of an AU (the Earth-Sun distance) from its star. Over a given orbit, the planet goes from temperate to roasting and back! It is so extreme that the rapid heating of the planet’s atmosphere has even been observed with the Spitzer Space Telescope. It’s like, going inside, jumping in a hot tub, getting branded with a red-hot poker, jumping back in the hot tub, then finally getting to cool off back outside. The big question is why. Why do HD 80606 b and these other planets have such an eccentric orbit? The short answer is that eccentric orbits are scars inflicted during a planetary system’s violent past. Planets form from disks of gas and dust, and these disks tend to be pretty circular. The gas has a damping effect and tends to keep all the planets’ orbits circular. So planets form on circular orbits. Any planet’s orbit stays the same if the planet is left alone. But planets don’t form all by themselves. Planets form as systems of many planets. And each planet’s gravity affects its neighbors. While the gaseous disk is present everyone is kept in line. Like a mother watching over her kids, keeping them from fighting. But once the gas is gone it is open season! This is an “in-house” instability where the planets themselves drive the system unstable. There is also the possibility of an external push to instability. A star could pass a little too close and upset the system’s gravitational balance. Even a wide binary star can drive a system unstable (see here for the effects of a binary stars on planetary systems). In fact, the star HD 80606 is indeed a member of a wide binary system. The plot thickens! The fact that so many planets have eccentric orbits means that dynamical instabilities are very common. For every well-behaved planetary system there are several volatile, unstable ones. This has some interesting consequences. For example, instabilities essentially pollute the local galactic neighborhood with leftover junk (planets, asteroids, comets). 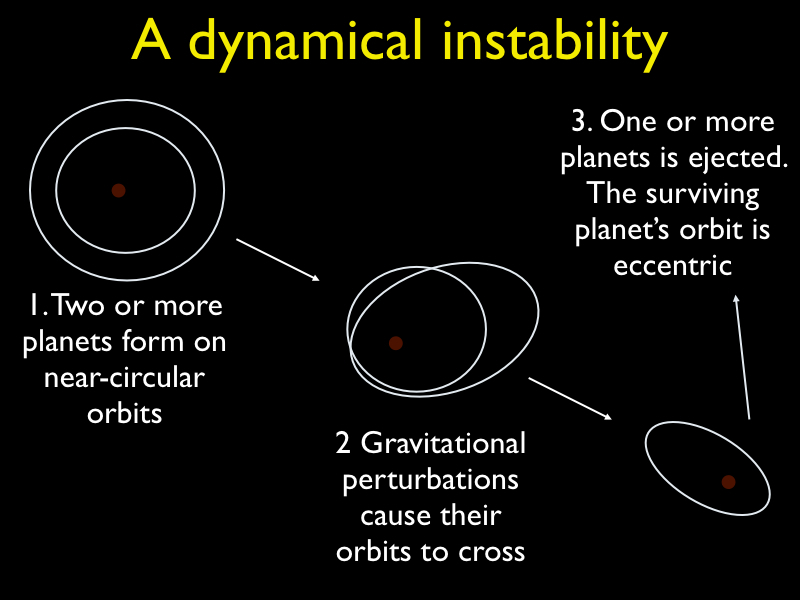 There you have it: planetary systems with eccentric orbits had violent pasts marked by dynamical instabilities. So these are probably not the best systems to look for Earth-like planets! March 10, 2014 in Galactic neighborhood. ← Hot Super-Earths (and mini-Neptunes)!